– No Harsh, No Redness with 0.045mm microfiber soft hairs. This is the first time I am using a brush to cleanse my face. So it was a whole new experience for me. This pore cleansing brush came in a plastic transparent box. The brush is small and super cute very similar to kabuki brush. It has a golden rim which makes the entire design attractive. How is the quality of the bristles? The pore cleansing brush has 0.045mm microfibre hair and they are extremely soft. I did not get any harsh feeling while using on my face. So I would say the quality of this pore cleansing brush is indeed high. I am currently using gel based face wash so what I do is first wet the brush. Then pour a small amount of the face wash over the brush and gently move it all over my face in a circular motion. The brush moves without tugging on my face. After washing my face I prefer closing all of my pores with ice cold water. 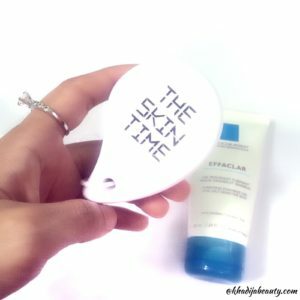 What did I feel after cleansing my face with pore cleansing brush? Right after cleansing my face with pore cleansing brush for the first, I felt my skin very soft. I used the same face wash which I used to cleanse my face on a daily basis. But after cleansing my face with the same face wash but instead of using the hand when I used this brush, I could feel the difference immediately. This pore cleansing brush not just take off the dirt from the deep pores, but also removes the superficial dry skin from the face. I felt my face very smooth, healthy and I didn’t feel any dryness on my face too. Which means this does not strip away the excess sebum from the face. But of course you should follow up the cleansing routine with toning and moisturising. I usually use this brush at night so that it can remove all of the dirt which has been accumulated all day long. You can use it twice or even once a day depending on your need. If you have a sensitive skin then I would suggest you use it every alternate day. This did not cause any breakouts on my face. When used regularly this brush will prevent the occurrence of acne and blackheads. Because when your pores are clean there is no chance of breakouts. And yes this brush reminded me of the brush which my dad used to use for applying his shaving cream? This is really very similar to that but the quality of the bristles are way better than those brushes. How to wash and store this pore cleansing brush? This is the most important thing because you do not want your brush to be a breeding ground for bacteria and microbes. Wash off the brush thoroughly and allow it to dry under sunlight. Sunlight will prevent the growth of microbes. Since the brush is dense it would take a longer time to dry. It is recommended to keep the product away from humid places. 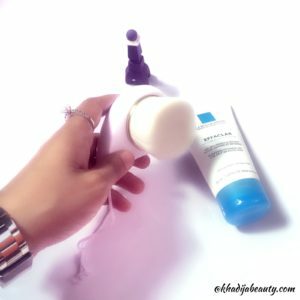 Why should you use pore cleansing brush? This pore cleansing brush really helps in deep cleansing the face without being harsh on the skin. I would highly recommend you to try this. Drying them takes time but it really does a good job in terms of cleansing. 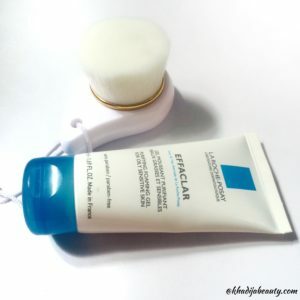 I haven’t use pore cleansing brush, and upon reading your reviews I think it’s time for me to experience a new level of skin care.Is this thing different from Clarisonic facial cleansing brush? Thanks! 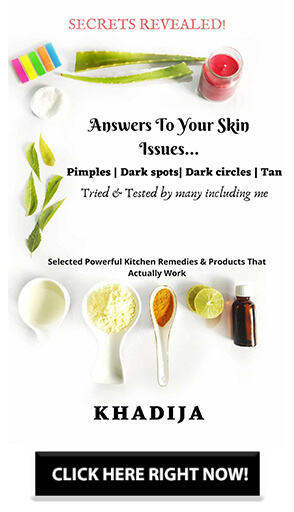 keep using, get flawless skin! Bit pricey but the results definitely out weighs the price! ? Sounds like an amazing product for oily skin types. Nice review. Thanks for sharing, I must be doing something right because LaRoche.posay has always been my number one choice for pore cleansing. I`m looking for a brush but not sure what I should go for, I have sensitive skin and need something gentle, what would you suggest? This is meant just for my skin as oily skin needs more deep cleansing. Awesome product!! ? I have never used a face cleansing brush except The Body Shop Face Brush of which I got bored very soon. This brush sounds really amazing & affordable.